VICTORY! Delta takes a stand against trophy hunting! Thanks to the nearly 400,000 of you who took the time to sign and share my petition. The sad recent news surrounding the illegal poaching of Cecil the Lion outside Zimbabwe’s Hwange National Park has captured the hearts of humans across the globe, and thrust the grisly practice of trophy hunting back into the international spotlight. The outpouring of attention and sentiment was a wake-up call demonstrating how many people care about the plight of endangered animals. Today’s action by Delta Air Lines shows that corporations can see the value in being compassionate, even when it potentially could cost them some income to do so. This is why I have logged nearly 700,000 miles with Delta in recent years and will continue to be a loyal Delta Diamond Medallion customer. I sincerely want to commend and thank Delta CEO Richard Anderson and his fellow Delta executives for taking this courageous stand and doing the right thing to protect our precious world wildlife resources. This all shows how the collective voice of people like you and Change.org really can make a difference. Indeed, in just the past 3 months since I started this petition, NINE other airlines have chosen to ban the transport of certain animal hunting trophies––British Airways, Lufthansa, Emirates, Qantas, Qatar, Etihad, Iberia, Singapore and Brussels Airlines. In addition, the Government of Botswana now has banned ALL sport hunting in their country, and very publicly condemned those remaining South African nations that still allow wild and canned hunting to continue in the region. One day I believe we will bring an end to the sport killing of any wild animals and stop their valuable lives from being reduced to mere trophies on a dentist’s wall. A heartfelt thank you to each of you again for helping ensure that Cecil’s tragic death was not in vain. PS - Please sign this petition asking the United States Fish and Wildlife Service to protect African lions under the Endangered Species Act. 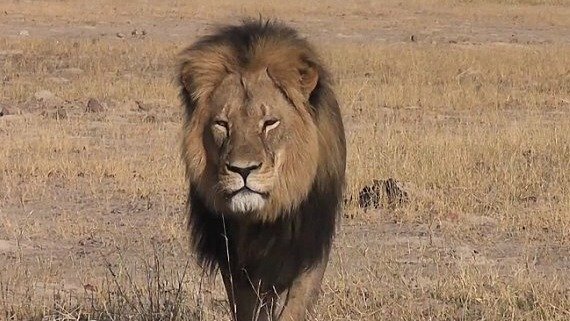 Cecil was a 13 year old lion killed by an American trophy hunter with the help of some locals in Zimbabwe. The key American suspect, Walter James Palmer, reportedly has a history of illegal hunting activity. Please sign my petition asking for full accountability and punishment for all those involved in Cecil's death. More carriers are banning transport of African hunting trophies. Will Delta commit to change? This petition made change with 392,825 supporters!